We are all Healers ~ Creating Enhanced Winter Immunity with Diet not Drugs! I wish I'd taken this gorgeous photo, but I did not. It's true origins are unknown. In the 18th century, there wasn't much recourse against a horrid epidemic of influenza, staph or plague except for holistic methods of keeping the body as strong and resilient as possible. Herbs, spices,onions, garlic, barks, tinctures, soups and distillations were the medicines of the day. Steam to open the sinuses and lungs, poultices, plasters and teas were used as first line medical defense and many of these are still methods that I and many other herbalists and aromatherapists use today. Jump forward into the 21st century and once again it’s flu season. This year it’s taken on a whole different meaning as we face the possibility of so many of the dangerous new strains of influenza that are emerging. I’m no different than any of you reading this and I worry endlessly about my families health and wellbeing. I work hard during these months to make sure that everyone's immune system is as strong as possible. I really avoid most drugs, unless its imperative that I take an antibiotic for my very survival! Instead, I prefer to hedge my bets by strengthening my immune system through the foods that I eat and the supplements that I use. I'm a firm believer that real health is inextricably linked to good digestion and elimination. Keeping those systems healthy is truly your first line of defense against most virulent strains of staph , strep or influenza. You owe it to yourself right now to begin to eat foods that move quickly through you, strengthening you and helping you fight off infection powerfully as a result of the natural ability that our bodies have to fend off disease. During the winter I’m constantly replenishing my stores of Echinacea and goldenseal, Vitamins B and D , elderberry tablets and essential oils. Oil of oregano is a must for any medicine cabinet as it's not only a vital germicide, but can help to control a stubborn candida infection. I’ve discovered that if I begin to take elderberry tablets at the beginning of the flu season that I feel very well protected, no matter who I come in contact with. Drinking steaming mugs of green tea sweetened with honey instead of my usual coffee always helps me to replenish the much needed moisture robbed daily from my skin by the bitter dry winds and artificial heating sources found in my home. Try to make this for yourself because mixed with white vinegar and put into a spray bottle it will become a potent antibacterial to use either as a room spray or surface spray for your entire home. Used in a diffuser, this oil blend creates a continuous line of defense against most airborne viruses that it comes in contact with. It’s a little too strong for most forms of personal use, but I will mix a few drops with some fresh vitamin E oil and massage the bottoms of the feet with it and then putting a pair of clean cuddly socks to help the oils soak in. That treatment coupled with a bowl of garlic miso soup with a bit of tofu and a warm mug of cayenne, cinnamon, honey and lemon tea can have me up and out again in a day! Speaking of cinnamon, I love to keep a pot of honey that I've literally stuffed with powdered ceylon (not cassia) cinnamon in the pantry. Just a spoonful of this delicious nectar can help soothe a scratchy throat or a cough very quickly and stirred into some hot water can provide simple nourishment when you're just not feeling like eating much. Now is the time for a good cleansing, but generally not of the fasting sort. If you’re anything like me, the bitter chill of the winter winds make that nearly an impossibility. Instead I prefer to treat my body to simple meals based upon mostly seasonally available foods and herbs that are designed to gently cleanse and invigorate . For example, I love to poach leeks and serve them with homemade mustard sauce and I make a homemade raw beet borscht with fresh dill, diced onions, cooked turnips and rutabaga that is a surefire remedy for adding iron to your diet and cleansing the blood. Vegetarian curries with cumin, ginger, garlic and tumeric can provide the warmth needed to rebalance the digestion and hot spicy salsas and moles made with chiles , dark chocolate, cinnamon and chipotle are another winter treat that those of us north of the border can use to fend off the blues of seasonal affective disorder and stay warm as toast all winter! I love a simple roasted chicken or vegetarian cutlet dressed with a spicy mole sauce and served with cumin scented black beans and a salad of fresh blood orange, jicama, pomegranate seeds with a red wine vinegar and oil dressing. A meal like this can bring the sunshine back to me in an instant! Soups are really easy to make and a good homemade bone broth is a wonderful foundation for creating all kinds of foods that promote healing. To make a good bone broth, start with fresh spring water or chicken broth and either a chicken cut into pieces or a pot roast (bone in). Organic and free range please! Then add onions, garlic, carrots, celery , beets, leeks, root vegetables, garlic, kale…you get the picture. It doesn’t have to be pretty to be delicious and fortifying. Quite often depending upon my mood I’ll add a bottle of red wine or some fresh apple cider. Many times I’ll use a chicken and pot roast together and sometimes I won’t use meat at all choosing instead several varieties of seaweed, seafood and shellfish. The rest is simple. Put it all into a stockpot and simmer for at least 6 hours. Making a good meat based broth does take some time but its well worth the wait. You’ll have to skim what is known as the “scum” off of it several times, but this added step will result in a clearer stock. 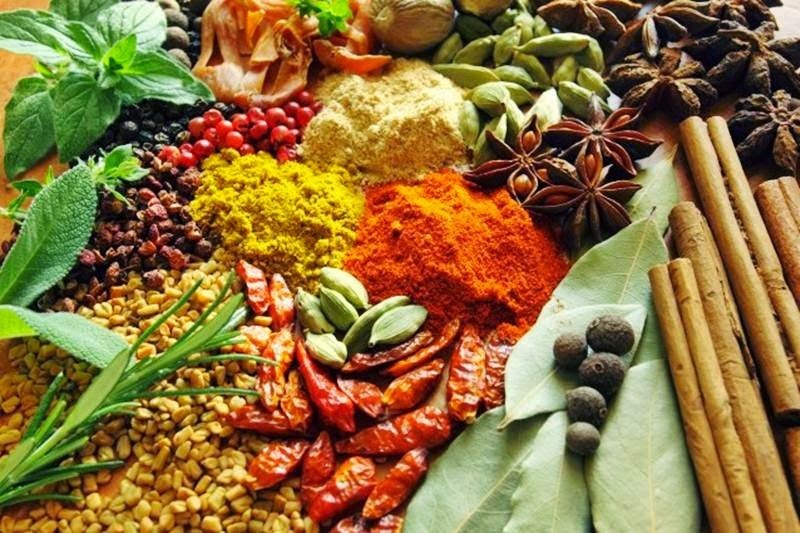 I love to add healing herbs and spices to mine, particularly cinnamon sticks, ginger root, cayenne and star anise for warmth. When it’s done remove the meat and the vegetables and put them aside to reserve for a later meal. Serving either the chicken or beef with a sauce of fresh horseradish or mustard is another way to raise the digestive fires needed for warmth at this ever so chilly time of year. Then strain the stock and give yourself the pleasure of putting some of the hot broth into a mug with a bit of salt and a squeeze of fresh lemon. Bon Appetit'! The end result after refrigeration of the broth will that the stock will be jellied...a sure sign that all of the nutrition, has been taken from the bones and put into the stock! So delicious and so good for you! Vegetarian broth will cook faster and you won’t have as much foam to remove but the end result will be just as delicious and fortifying! Add a bit of miso, green onion, cubed tofu and shitake mushroom to a vegetarian broth to make a satisfying tonic to revitalize and replenish the vitamins and minerals that are lost through the simple stress of everyday living. Either of these stocks can be used as a base for many different delicious soups like a spicy chicken chili, lentil or white bean with kale, squash and sweet potato.The only other thing needed for either of these meals could be a simple green salad with a bit of lemon juice and oil and a lovely glass of red wine. If you’re really cleansing, avoid heavily processed cheese and bread for now and any other complex carbs like rice or pasta that can really clog up your system. During this time I try to stay away from regular white fleshed potatoes because they convert to sugars so quickly and without the more complete nutrition of yams or sweet potato. You won’t regret abstaining from them for a week or two and you might discover that your body doesn’t rely on them as much to create energy after a time. See if you can avoid coffee or black tea for this time period and allow your body to begin to rest and heal for a bit without artificial stimulation. Your stress may even go away, enabling your body to begin to relax,heal and regenerate. For some, green tea may even be too much, so instead drink a cup of hot water with a teaspoon of good olive oil, honey or agave, with some lemon squeezed into it to cleanse, nourish and revitalize your liver. I would be willing to bet that after a week or two of eating clean , nourishing meals that you begin to find renewed stores of energy and creativity as well as vastly improved immunity and health. Eating simple wonderful food that you've prepared brings you in contact with your native wisdom and intrinsic needs. Although I don't eat much meat anymore because it depletes my energy, it may be the very thing needed to help you heal. Listen carefully to your body, feed it well and it will reward you with many years of balanced energy and health! “I woke just past dawn to the scratching of the rose brier against the window, and the muffled thump and clang of breakfast fixing in the kitchen below. Peering over Jamie’s sleeping form, I saw that the fire was dead out. I slid out of bed, quietly so as not to wake him. The floorboards were icy under my feet and I reached, shivering, for the first available garment. As I've said many a time before, my favorite scenes from Outlander always seem to be in a kitchen, around a cooking fire, in a bedroom with a peat fire and stone hearth or in a parlor replete with brandy, tea or oatcakes! The act of breaking bread together in and of itself is an act of bonding and creating community; add a fire and you've added a generous measure of warmth and safety. Over the years many have asked me about Emily, my old wood fired stove. Here she is in all of her glory! She's a good old fashioned Dutch West cast iron workhorse capable of going up past 1000 degrees really quickly once you fire up the catalytic converter! When we left our farm in Burton, I couldn't bear to leave her there, so I uninstalled her and now she lives with good friends of ours who enjoy her warmth on a regular basis. At this point I've written about Emily so many times that she's begun to really have a persona of her own. I loved sharing life with her, she was the provider of many a fine breakfast, lunch and dinner at Windesphere when the power would go out. On evenings without heat, we'd curl up with our blankets and pillows, lay down around her (cats and dogs too! ), watch the flames dance and wake up in the morning safe and toasty warm. Even when the power didn't go out, I'd still wake up on a cold morning and cook pancakes and bacon on top of her broad hot shoulders. The best oatmeal in the world is oatmeal that you've put on the night before in a cast iron pot, set on top of the warming stand on a woodstove and allowed to simmer gently though the night. Add cinnamon, raisins and whatever spices you want and you've not only got breakfast, you've got warm and spicy potpourri! I hadn't seen her in over 8 years but we went out into the country a while back to have dinner with our old neighbors and there she was, logs a~blazing, standing stalwart in the corner and heating their home as capably as she'd ever done ours. It was so good to bask in her warmth again and furthered my resolve to have a smaller version of her placed in my home by next winter. Bourbon Milk Punch! Photographic origins unknown! I love milk punch! This relatively old recipe is one that never seems to lose its intrigue and in my mind is a too often overlooked staple of the holiday season. I'd had it many times, but had forgotten about it over the course of many years as delicious organic eggnog became so readily available in the stores. However my good friend Justin taunted me one day with the promise of a homemade milk punch that would swear me off of eggnog forever. I waited and waited and then one day he waltzed into my Solstice party with two bottles of a wonderfully thick looking wintry white drink! He intrigued me with tales of it's creation, how it had been carefully mixed, re-poured and allowed to mellow for three days in a deep chilly snow bank. I opened the bottle and poured a small glass. It was incomparable, a divine taste of nostalgia and yet so completely modern as to be deemed one of the sexiest flavors that I'd ever put to these lips! At first taste there was ice cold cream and vanilla but seconds later I was captivated by the flavor of a really great Bourbon laced with a liberal sprinkling of sugar and nutmeg...irresistible! I was blown away, how could anyone thing taste so good? I have begged him for the recipe which he will not divulge. So, I have played with the recipe myself and I must admit that I think that I've done the memory of that first sip justice. Milk Punch is an ancient drink that has changed many times over the centuries. Some recipes call for lemon juice but I don't like those. I prefer the experience of pure cream on snow with a bit of lemon zest for sunshine, bourbon for frolicking and lots of fresh spice for warmth. This recipe makes a wonderful gift to bring with you to winter gatherings. My pal delivers his in old fashioned glass milk bottles with a request to save them for next year and promising refills! He walked into my Winter Solstice gathering the other night with two of those bottles and at first sip I was smitten again! Treat yourself and use organic milk , half and half and cream. You'll get the great glass bottles that way and a much richer flavor and the benefit will be that you can start your own holiday tradition but be warned , once you make this you'll never be allowed to stop, it's that good! Simply pour the milk, half and half and cream into a bowl and blend for a few seconds. Add the Bourbon , sugar and vanilla, blend for a minute until frothy. Add the rest of the ingredients and stir. If you were bottling this and you have lovely winters snow on your hands I'd tell you to place the full bottles outside in the drifts as this will make the finished product thick and slushy! (You'll need one extra bottle to accommodate the overflow!) Sans snow, simply place the bottles in the refrigerator and allow to chill! You can even put a bottle in the freezer for about an hour before serving and it makes the finished product wonderfully creamy! Allow enough time for the finished punch to mellow for about two days before serving or the Bourbon will taste too raw. To serve, just pour the milk punch into a julep cup or a punch glass and enjoy! If it's cold enough, no ice will be needed! If you're making it for a party, put it into a punch bowl that is sitting on top of an ice ring or in a larger bowl of ice to keep it cold but not diluted. Place some lovely wintry greens around the base of the bowl and you'll have a wonderful cocktail for a buffet that's delightfully reminiscent of a really old fashioned holiday! Now for fun watch this great video. He makes his with Brandy which is equally as good although I do prefer bourbon myself. He also uses simple syrup while I definitely prefer the confectioners sugar because I think that it makes it thicker. His is a great recipe for one drink at a time. Enjoy! “The house was bright that night, with candles lit in the windows, and bunches of holly and ivy fixed to the staircase and the doorposts. There were not so many pipers in the Highlands as there had been before Culloden, but one had been found, and a fiddler as well, and music floated up the stairwell, mixed with the heady scent of rum punch, plum cake, almond squirts, and Savoy biscuits. Jamie had come down late and hesitant. Many people here he had not seen in nearly ten years, and he was not eager to see them now, feeling changed and distant as he did. But Jenny had made him a new shirt, brushed and mended his coat, and combed his hair smooth and plaited it for him before going downstairs to see to the cooking. He had no excuse to linger, and at last had come down, into the noise and swirl of the gathering. This recipe is no less magical and absolutely decadent! It's so easy to make and it's even better when served in a punchbowl surrounded by spicy yuletide greenery! You can make the recipe from scratch if you desire and if I have the time sometimes I will using whole organic eggs, milk, sugar and cream, but frankly when the good organic eggnogs are so plentiful why bother (and you have the added bonus of not having to worry about raw eggs)! Also, if you have anyone in your family who is allergic to milk or eggs, don't forget about Silk's soy eggnog or SoyNog as I believe it's called! Actually all of the milk substitutes (actually I think that it is a real disservice to call them that, as they are delicious in their own rights!) are creating wonderful "eggnogs" that you can use as the base for this recipe. They're absolutely delicious and you will be able to serve a delicious and festive holiday beverage that leaves no one feeling left out! The good news for vegans this year is that you don't even have to omit the whipped cream because theres a fabulous whipped rice cream available in a can and ready to use like Redi Whip. Made by Soyana, you should be able to find it easily at your local Whole Foods. At any rate every year, people beg me for this recipe and I'm always so embarrassed to tell them just how easy it is...with this one it's all in the presentation (and the rum!) At last years Winter Solstice party I think that we went through about 3 punch bowls of it and lots of the RSVP's for this years party start with "Ill see you around the eggnog bowl!" About 6 cups of dried raisins that you've soaked for about 6 hours in a lovely single malt scotch ,reserving the scotch for the eggnog as well! Lots of whipped cream that has been infused with vanilla extract, brown sugar and some rum flavoring. For this I like to beat my whipped cream by hand in a copper bowl with a whisk. It takes a little longer but the cream is a wonderful silken consistency. Don't worry if you don't have a copper bowl and just do it the traditional way. It will be just as yummy! Nutmeg for joy and good luck, Cinnamon for love and prosperity and Allspice for continuous good health throughout the year! The recipe itself is quite easy, simply put the eggnog into a punch bowl and whisk in the rum and brandy. Ladle the whipped cream onto the eggnog so that it looks like fluffy clouds of cream, sprinkle with the spices and serve. Put some of the raisins in each serving. You will need to add more whipped cream on top as the evening unfolds because the cream continuously gets folded into the eggnog, making it AMAZING! Serve in a lovely punch glass or a pretty tea cup with a kiss and a wish for a marvelous New Year! For lots more Outlander fun please visit me at Milady's Pantry and My Outlander Love Affair on Facebook! I don't know how cold it is where you live but here in Northeast Ohio it's very chilly at this time of year. In January when the temperatures dip into the single digits I really begin to feel rundown, almost like I just want to hibernate for a while. That's when I know that it's time to break out the Fire Cider! Fire Cider is an old fashioned herbalists remedy full of warming herbs, roots, vegetables and spices. Everything in it is dedicated to warming the blood and helping to stimulate the digestive fire. Unlike most of my tinctures this one is vinegar based so it's really a fermented food , not just a medicine. The apple cider vinegar base is so good for your digestion, helping you create an alkaline environment in your body which is necessary to keep the immune sytem functioning in tip- top shape. Every person that I know makes theirs just a little bit differently so Fire Cider never tastes the same from one batch to the next. I like mine very spicy and heavy on the garlic and horseradish. I add beets for color and also as a blood purifier. Warning! Just a little of this goes a long way and if you've got blocked sinuses this is your perfect food! One last thing. 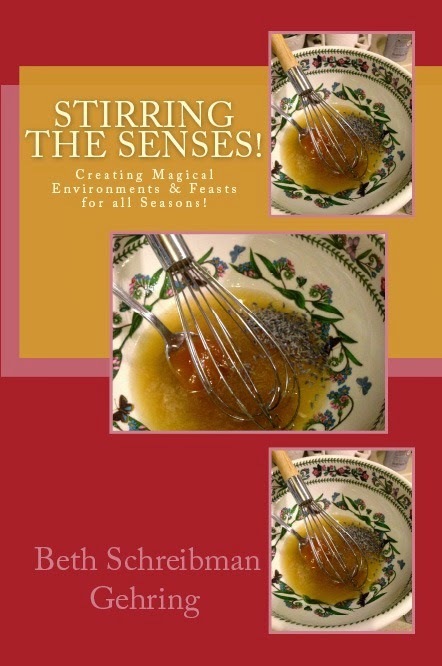 I share my recipes because I believe with all my heart that herbalism is a form of medicine that belongs to the people and I hope that you'll have so much fun making them. 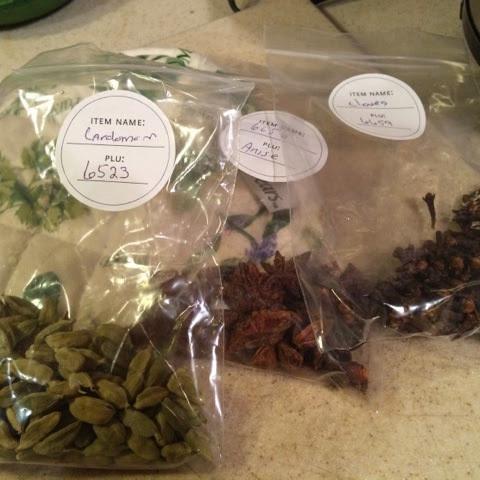 Herbal remedies like these have always been passed down from generation to generation; almost every herbal culture has some form of this Fire Cider. One of the things that I love the most about the Outlander series are the cooking scenes. 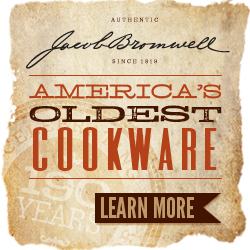 I love to imagine myself in Jenny's kitchen stirring bubbling pots full of delicious things to feed my family. I can close my eyes and imagine myself throwing open the windows at Lallybroch and smelling the fresh clean air. I smile as I imagine myself reaching for my crystal decanter full of whiskey and pouring myself a wee dram to sip while I stir pots full of soup and jam over the wood burning oven. In my mind I prepare delicious cakes for tea and wonderful dinners for the long cold nights. It's the best fantasy ever for a girl like me! How I long for a wood stove again. When I had one at my farm, I would always use it to cook with. I loved the self sufficiency of it. I remember many a cold morning when we would lose our power but I could always feed my family with a few logs and my favorite cast iron frying pan.I used to make slow cooked oatmeal on my woodstove and also flapjacks,bacon and soup. Occasionally I would make fruit butters. They were always delicious, thick, rich and smoky! Today was a beautiful autumn day so I spent it making pear butter. Lacking a fire and a cauldron I decided to use my slow cooker.The result was surprising and filled with a few twists and I even learned a cheat that I'm going to pass on to you. Of course I began with fresh pears, three different kinds. I diced them and put them into the slow cooker with a little bit of olive oil and a knob of fresh butter. 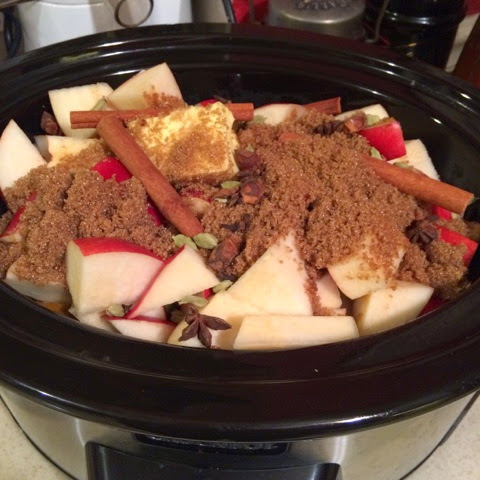 Then I added pear juice, cinnamon, anise,cloves,Cardamom and brown sugar. I simmered this in the slow cooker on low for 10 hours. After 10 hours I added more diced pear and let it cook for a few hours more. At that point I decided that it was too juicy and I knew I needed to thicken it before I put it in the canning jars, but I jusst wasn't sure how to do it. So I went to the grocery store and I bought raisins and currents. I thought about buying figs and then a thought passed through my mind. Instead of dried figs, I bought a jar of French fig jam, full of figs and added pectin. My reasoning was that if I used the jam, perhaps my mixture would thicken on its own. I came home and started the pot simmering. 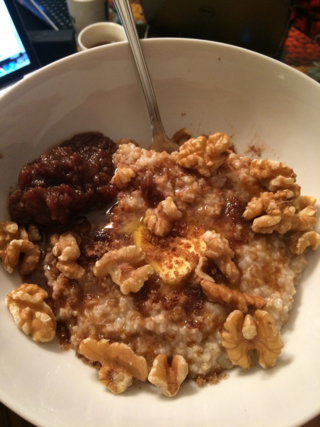 I added the dried fruit and the fig jam. I continued to stir patiently. Lo and behold , the pear butter began to thicken! I poured it into canning jars to which I'd added a tablespoon of lemon juice ( each jar) and water processed them for 30 minutes. That fig jam was one of the best cooking cheats that I've ever discovered! I cracked open a jar about an hour ago and it's absolutely yummy; beautiful, creamy , fruity and thick and ready for holiday gifting! “We had wakened in the dark after moonset, leaf-spattered, twig-strewn, bug-bitten, and stiff with cold. We had said not a word to each other, but laughing and staggering drunkenly, stumbling over roots and stones, had helped each other through the moonless wood and made our way back to bed for an hour’s brief sleep before dawn. I leaned over his shoulder now and deposited a bowl of oatmeal in front of him, pausing to pluck an oak leaf from his hair. I laid it on the table beside his bowl. 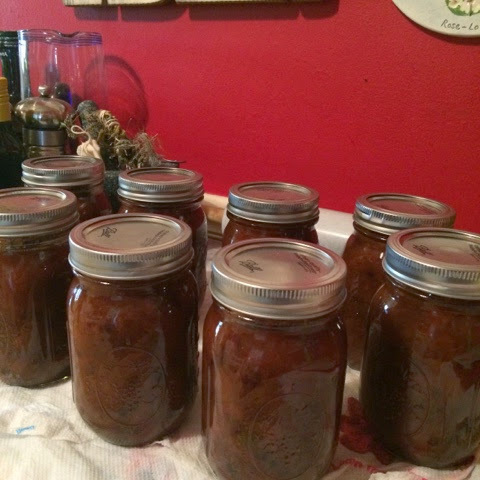 I spent a wonderful day last week making apple butter and many of my readers asked for the recipe. 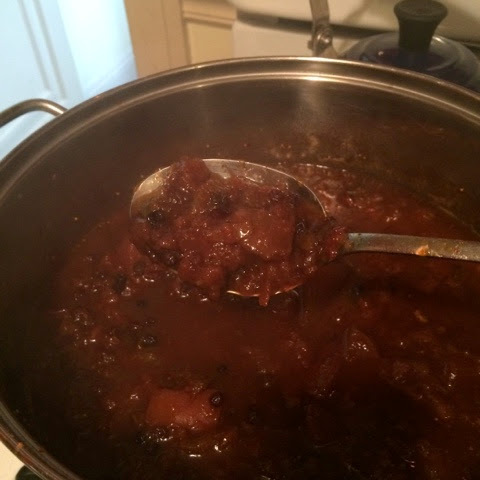 Normally, the best way to make apple butter is over a hot wood fire, apples simmering away for hours in a large copper cauldron with pats of butter added and lots of brown sugar and cinnamon to finish. Lacking the 50 gallon cauldron and the woodfire, I've devised another method that works well. I use my slow cooker (which is a cauldron of sorts!) and it works verra weel! All you do is take a bushel of apples and dice them. You can peel them if you like and that makes a smoother apple butter, but my family loves the peels so I leave them on. I put them in the slow cooker until the pot is full and then I add about 2 cups of sweet cider, about 1/2 a cup of chopped crystallized ginger, a lot of cinnamon, 1 cup of bourbon or single malt and at least three cups of brown sugar. Then I turn the crock pot on low and I use the 10 hour setting. I watch it and stir occasionally and at a pat of butter every once in a while which keeps the foam down. As the mixture "melts" down, I add more apples and brown sugar. I let it cook for about 18 hours on low, stirring and tasting as I go. At about the 14th hour I add about a cup and a half of maple syrup and 3 tablespoons of pumpkin pie spice and stir. Then let it continue to cook for several more hours. 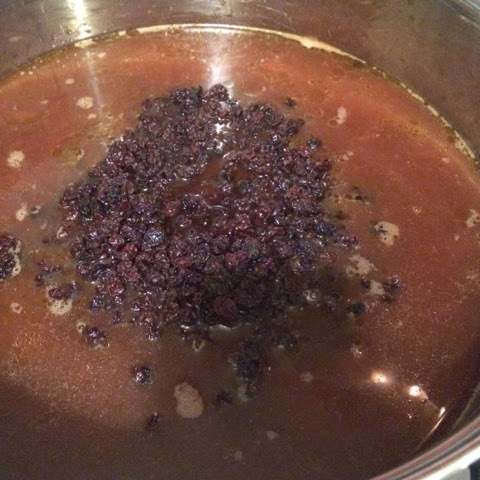 You'll know it's done because it will have turned a lovely color (rich caramel) and will smell absolutely wonderful. Cooking it for that long concentrates the flavors and produces a butter that is absolutely delectable. Right before it's done, I add a tablespoon of smoked paprika. This adds a touch of smoky wildness that I love! You can use your apple butter in so many ways......on hot buttered biscuits, waffles, pancakes, as a filling with fresh apples for pie or on oatmeal as I've done here with brown sugar, cinnamon, walnuts and fresh butter. It's a bit like having dessert for breakfast! A steaming cup of coffee with cinnamon or a delectable cinnamon tea seals the deal!